Season 1 was spectacular; Season 2 not so much; Season 3 picked up steam again — but from thereon, it went into a downward spiral. I was, nevertheless, still hooked. There was something about HoC (those of you who’ve followed it will vouch for it) that made it tough to put the cards on the table and walk away. The Netflix series was introduced to me by a friend who will go down in my personal history as ‘The One Who Got Me Acquainted With House of Cards’. He gifted me the DVD set of the first season, at the end of 2013 (House of Cards premiered in early 2013 on Netflix, and went into DVD format a few months later). I watched it at one go, all almost-50-minute-long 13 episodes: started one Friday morning, wrapped up in the wee hours of Saturday. From Season 2 onwards, I switched over to Netflix. So, since 2014, whenever the once-in-a-365-days moment arrived, that moment of reckoning when the new HoC season would be telecast unfettered, I’d become a fixture on a comfy sofa, and binge through the night and the day after. It used to be my annual outing. But last week, when Season 6 – the final season of HoC officially “opened”, I was nowhere close to a television set. And I don’t plan to watch it anytime soon — maybe never (unless I’m really at a loose end). There’s a reason. It’s got to do with Kevin Spacey exiting the cast in real life… and Frank Underwood following suit in reel. Thanks to Spacey’s exit, President Frank Underwood is now dead with no real explanation given as to what actually happened to him (that’s not a spoiler by the way, the trailer – that I did watch out of aimless curiosity – is full of it). 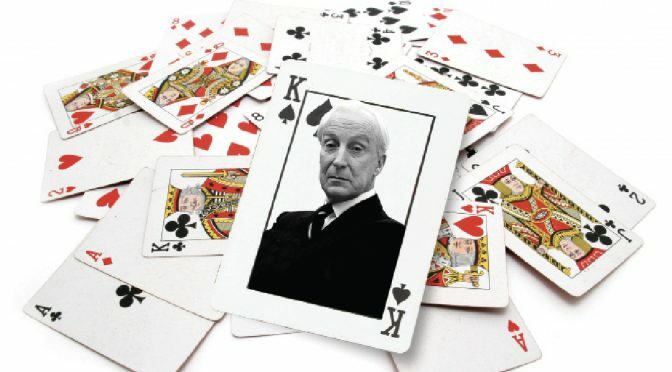 But, first, let me tell you about the “original” Frank Underwood: Francis Urquhart of the BBC original House of Cards, based on the book by Michael Dobbs. In the BBC series — the inspiration for the Netflix avatar — that ran between 1990 and 1995, Urquhart is played by genius British stage actor Ian Richardson. He’s the British Prime Minister, the mise en scène is 10 Downing Street (as opposed to Underwood’s American President and the White House, respectively, in the Netflix one) and the series begins and ends with him; there’s no halfway house; it’s his show — from being the King of Spades to Ace of Base. There’s not a single shot (of consequence) where he’s not in the frame, and yet you cannot have enough of him to loathe and love. I’d picked up the BBC House of Cards DVD box-set in Delhi quite by chance; it was 2015, and it had been two years since my love affair had started with the Netflix series but, by then, I was cognizant of its “roots”. As I was loitering around in the by-lanes of Khan Market, I spotted the box-set staring down at me from a shop window. I’d been most curious about the real McCoy, and had heard accounts of how it’s very difficult to get hold of a copy of the series (though there are some dodgy online uploads), so I immediately gifted myself the box-set. I binged on it in good time, and realised brevity is the soul of a true thriller. Conspicuously shorter — the BBC one has three seasons, and four episodes in each season (basically 12 chapters of 50 minutes), compared to the Netflix one that has six seasons, and 13 episodes in all but the final season, that has eight — it’s crisp, taut and edgy. There are no stylised set designs and colour coordinated nuances, but it’s an unstoppable, breathless spree. Urquhart’s catchphrase “You might very well think that, I couldn’t possibly comment” trumps all of Spacey’s heaving and pitching. Once you watch it, you realise how vital the central character is to the plot, and how utterly useless it is to even try and get him out of the picture. With Frank Underwood now dumped inside a grave, the Netflix House of Cards may well be dead for me. Previous PostThe dark side of racism and casteism and why we strive for more humanityNext PostWhy on earth do I keep losing my glasses?